Cherry Picker, Other Accessory For Microphone from Radial Engineering. 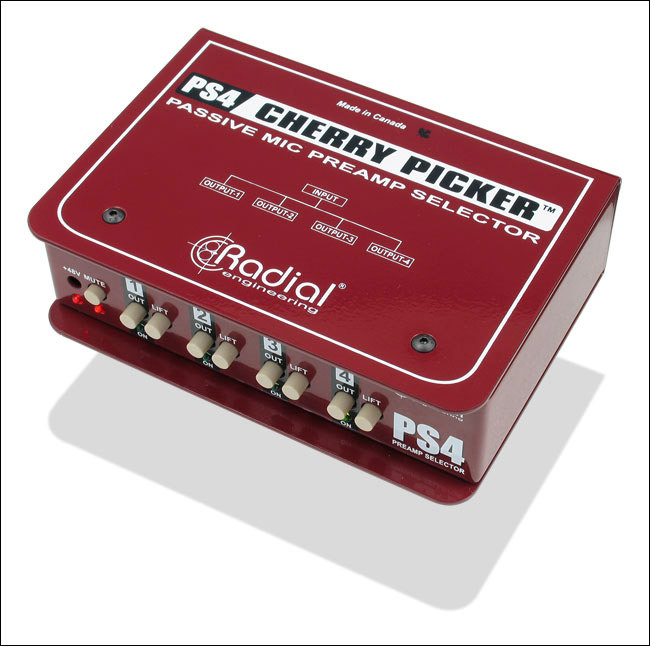 Radial Engineering introduces the Cherry Picker, that lets you connect a microphone and select between four mic preamps to optimize your signal path. 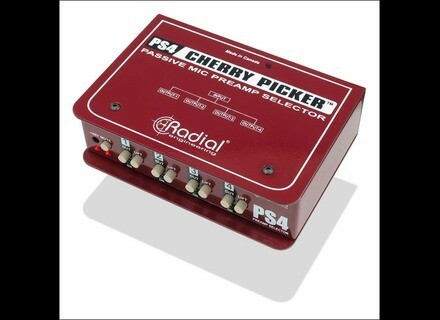 The Cherry Picker is a 'straight wire' passive switcher that features a balanced mic input with four outputs. Front panel 'radio-style' selector switches enable the engineer to select the active preamp while the Cherry Picker automatically shuts off the others. Audio signal switching is actually performed using gold contact sealed relays. To ensure quiet switching when using studio condensers, the Cherry Picker generates its own 48 volt phantom power for a stable supply to the microphone, the company says. This is designed to eliminate turning on and off the phantom power on each preamp. Each output is equipped with a ground lift switch to help eliminate buzz and hum caused by ground loops. A cfront panel mute switch allows the Cherry Picker to be put on hold while the microphone is exchanged without having to readjust signal levels or mute preamps. The Cherry Picker will start shipping in November 2012. Estimated retail price: $400 USD. More information on the Cherry Picker. Tascam DP-32 Digital Portastudio Tascam introduces DP-32, a 32 track Digital Portastudio with solid-state recording, a colour LCD display and channel strip controls. A&H iLive "Grand Slam" Rebate Allen & Heath USA launched their iLive "Grand Slam" rebate program which offers cash rebates up to $2000 on the digital mixing system.